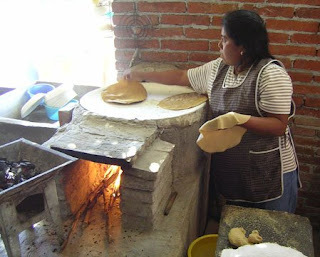 Don Renaldo and the Guttierez family are Oaxacan artisan mezcal makers and gifted cooks. We dropped in one afternoon for a tasting and to partake in a special meal. 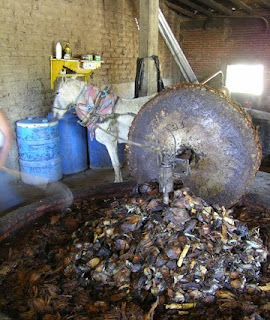 Unfortunately, we missed seeing the giant agave hearts or pinas being roasted in pits, but we can always return. 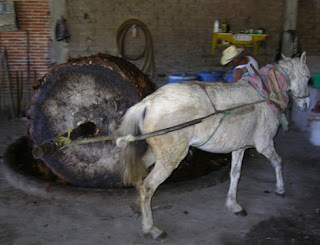 Once the maguey is roasted, horses are employed to drive the stone wheel around a circle, grinding the mass. It’s slowly worked to the edge until it is the right consistency, with Don Renaldo moving more of the mass to the edge to be ground down. There are 30 horses in the village that do this kind of work, working three hours at a time. Yes, with breaks. 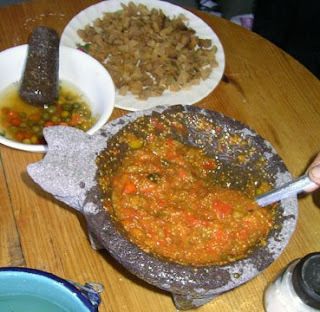 Once the grinding process is completed, it begins its fermentation process. 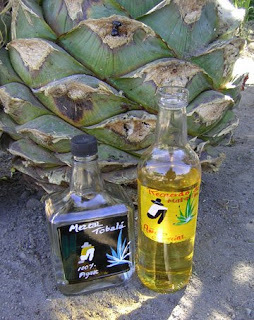 Don Renaldo makes a series of mezcals: Tobala, made from wild maguey with notes of peppermint and eucalyptus. Anejo, aged 16 -17 months in Mexican oak, delicately sweet and smokey reminiscent of creme caramel. Smooth as silk. 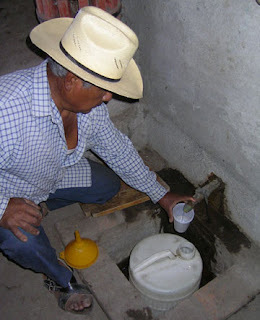 Minero con Gusano, an unaged elixir made from cultivated plants. Anejo Especial – aged two years in oak with a piece of roasted maguey providing a nice sweetness. 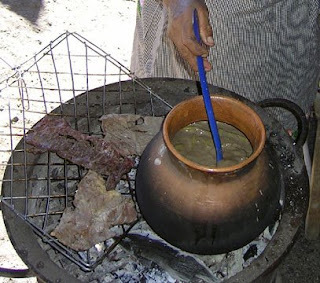 And pulque, a milky juice, lightly fermented and low in alcohol, tapped from the maguey while it’s still in the ground. 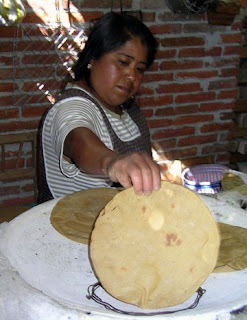 Our special meal began with hot-off-the-comal tortillas made with a mixture of corn masa and the caramelized heart of the maguey. 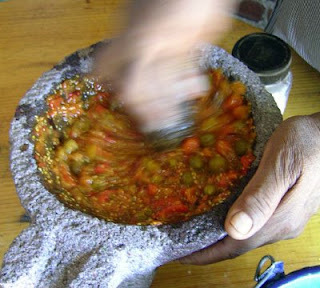 ( About 2kg masa to 1kg of maguey). 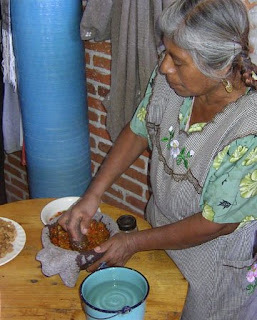 Senora Guttierez demonstrated how she makes her salsa with freshly picked wild tomatoes, cooked in a bit of water, and ground in the volcanic stone molcajete along with a chile canario, a clove of garlic, salt and 12 gusanos that had been first cooked live on the comal and smoked. The plate below shows the bits of roasted maguey that we could sample. Candy!! We topped our warm tortillas with the salsa along with queso panela which has a tangy-salty flavour while sipping freshly tapped pulque. 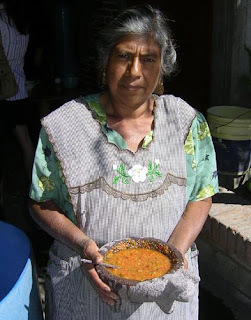 Then came the roasted pumpkin seed sauce, a version of pipian (it’s cooking in the olla/pot below). 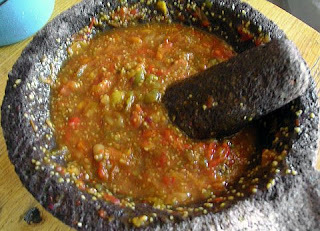 This silky smooth sauce had the addition of toasted avocado leaf for an anisey hint, and a ground chile canario. It was served with pieces of tasajo grilled on the coals, and we could add or subtract salsa, cheese and sauce as we chose. It was incredibly filling and we all walked away with a couple of bottles of mezcal to take back home. Here is photo of Don Renaldo at one of the stills, sampling the first 100 proof pull. This experience would satisfy even the most seasoned aficionado of all things Mexican. You’ve captured the wild, smoky flavours of Oaxaca beautifully! How wonderful to read this post, especially after experiencing it first hand. It makes me want to go back for more.